Decorative commercial quality resin tabletops that are resistant to scratching, staining and burning, with metal pedestal frames. Specially designed for the food service industry so aside from being easy to clean with only soap and water, the tabletops are also invulnerable to rusting, fading and just about any weather condition. 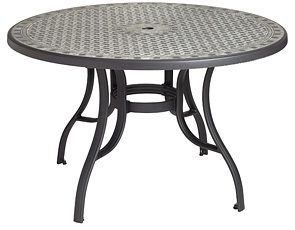 Wide 4 prong table base with self-leveling legs to balance table on uneven surfaces.